"Rendezvous in Syndro-polis" in Berlin. Is this city dying or surviving? In the same way as the advanced medicine makes a human being to be a cyborg, a city that is taken by science technology and controlling structure may also lose something important and organic elements because of high priority of the system. Cityscape shows us externally new and active surface, however it may be an aggregation of the ruins in fact. 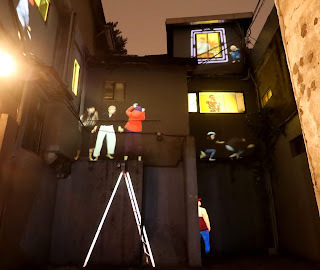 The images of our daily lives with problems such as poverty, gap, immigration, distinction, struggle, terrorism, economic crisis etc., are projected on our commodities and household electric appliances. There you can see a miniature impressed on wastes and gone. 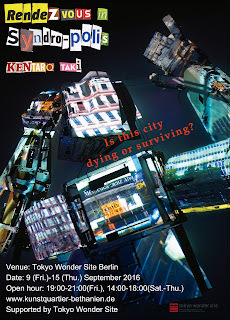 Kentaro Taki, a video artist from Japan, produces his latest installation piece through his first residency in Berlin.